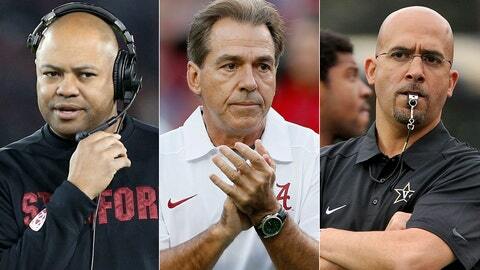 David Shaw, Nick Saban and James Franklin should all get a look from Texas. With Mack Brown now officially done at Texas, it’s time to look at candidates to replace him. But first, be careful what you wish for, Texas fans. Brown went 158-47 in 16 seasons at Texas. Phil Fulmer was 152-52 in 16 seasons when Tennessee fired him. Since then, the Vols are 23-27 and now on their third different coach. (Fulmer was 29-21 in his final 50 games while Brown is 30-20. Really, the similarities between these two guys are insane). Most fans believe things can get only better when a new coach is hired. That’s because all fans are innately optimistic. But be careful — things can also get much worse. That’s why the new hire is absolutely critical. So who do I think will be on Texas’s hot board? Here are 12 college head coaches (excluding rumored NFL names for now) I think the Longhorns would consider. Note: FOX Sports 1 and Outkick Vegas insider Todd Fuhrman recently posted his odds for who will be Texas’ next coach. Our lists vary a little, but I’ve included Todd’s odds and comments where applicable. Yes, yes, I know Saban has said a million times that he’s not going to be the next coach at Texas. And I know that Saban just agreed to an extension and said he’d spend the rest of his career at Alabama. Thank God Saban has never lied about a coaching job before. Why not still try to hire him now that there’s finally no coach at Texas? Can you imagine the reaction in the state of Alabama if Saban’s last game was the loss to Auburn? The state would burn. Fuhrman’s odds: 2-1. I originally posted on Twitter that he should be 10-1. Upon further investigation, it appears there’s a lot more noise about Nick considering a move away from Tuscaloosa, meaning a drastic requirement was needed. We all know the story about his wife looking for a place in Austin earlier this fall. Clearly that was just for their potential retirement, right? Stories have surfaced about Saban’s financial security as well given some wayward real estate investments tied to SEC boosters. He’s accomplished all he can at Alabama in my opinion. Why not bring another proud program back to the zenith of college football for your final career achievement? Stanford’s coach has run up a tremendous resume playing a physical, dominant style with kids who get work done in the classroom as well. He’s young, passionate and well versed in running a program without every competitive advantage. How would Shaw do running a program with every competitive advantage? Really damn well. Fuhrman’s odds: 8-1. Stanford didn’t miss a beat when Jim Harbaugh left for the San Francisco 49ers. Shaw has shown the knack for getting to BCS bowls, winning games and playing power football. I’m convinced if you can win at Stanford, you can win just about anywhere. Would Shaw, a Cardinal lifer, leave Stanford, though? I know he just signed an extension at Baylor, but college coaching contracts are generally worthless. Briles is already dominating in the state of Texas at a school with a fraction of the Longhorns’ appeal. Can you imagine what his offense could do with Texas talent? Better get him before the Washington Redskins do. Fuhrman’s odds for Briles and Sumlin (below): 10-1. Why am I grouping these two coaches together and offering them for the bargain price? Because both just recently signed extensions, and I’d imagine their respective administrations would rather blackball them out of the business entirely before letting them head to Texas. But I never say never in this business where money is king, given both of these top coaches would do wonders for recruiting the best offensive talent in the land. Do I think either of them will make the leap? Not really, but rather than offer them individually let’s go package deal for the old SWC connection. Yes, Sumlin has a $5 million buyout and makes $5 million a year. But that’s pocket change for Texas. So can you imagine the joy that Longhorn fans would feel in stealing away the state’s hottest coaching star? Especially since that Aggie little brother has surpassed Texas as the preeminent program in the Lone Star state, what better way to strike at the heart of a rival? Fuhrman’s odds: See No. 3. Vandy’s 15-4 in its last 19 games. Only Alabama has a better record in the SEC during that time. In addition to winning, Franklin has notched top 20 recruiting classes at Vanderbilt. Young, charismatic and eager to rile up a fan base, can you imagine what Franklin could do for a Texas program losing ground to A&M and for the Longhorn Network? At this point, Franklin’s leaving Vandy only for a top 10 job. And if Texas came calling, Franklin would take the job. Fuhrman’s odds: 7-1. You want to talk about a fun hire? Here’s your guy. His youthful exuberance and ability to coach up three-star recruits in just a few short years at Vanderbilt give him a compelling resume. Imagine if he had the resources of a Texas behind him coupled with an illustrious football tradition rather than building a program from scratch. I was surprised he didn’t get more serious consideration for the USC job, but Texas would be foolish not to consider him for this spot. The big winner if Franklin bolts for Austin? The younger Stoops along with every Tennessee and Kentucky fan. Gundy flirted with Tennessee last year before agreeing to stay at Oklahoma State. If you could steal away a proven success in the Big 12, why not do it? Gundy would listen to Texas for sure. Would he just use the Longhorns to get a raise? Maybe. But lots of coaches will do that. Fuhrman’s odds: 9-2. I heard his name thrown around recently by close industry colleague Adam Kramer. He made great points about what Gundy’s done to bring Oklahoma State back from the abyss. The major strike against Gundy is he’s struggled to get through Oklahoma, which won’t sit well with Texas boosters. However, he’s known for explosive offenses and an exciting brand of football, which would be very attractive to the fan base. His questionable track record of in-game management is cause for concern. However, his familiarity with the fertile recruiting grounds around the Big 12 makes him a very logical fit in Austin. He got an extension for listening to interest from Arkansas, and he’s won big at LSU. Plus, he’s been a head coach at Oklahoma State. Can you imagine Les with the Longhorn Network carrying every one of his press conferences? Might he be tired of competing in the SEC and see an easier road to the national title at Texas? He just said no to Washington and agreed to an extension with the Bruins, but would he be able to say no to Texas? He’s won fast at UCLA. He’d also win big at Texas. Fuhrman’s odds: 12-1. Another name that’s been thrown into the mix, but I believe his rumored interest in Washington will be his only foray into testing the waters this offseason given his recent extension. I know he’s done a great job with the Bruins, but I don’t get all the fanfare around why Mora is such a coveted commodity. With Teddy Bridgewater leaving Louisville, how much higher can Strong take the Cardinals? The reason I don’t have Strong higher on the list is because he’s had a rough relationship with the Louisville media. Yeah, the ones covering football in Louisville. If you can’t get along with that group of media, how in the world are you going to handle the Texas hordes? Not well. Would Texas really wait a month, until the BCS title game is over, to hire a coach? Especially given how insane the Texas coaching search will be? Plus, Jimbo’s got Jameis Winston back for another season. I’m tossing him in here because otherwise people will ask why he isn’t on the list. The easy answer is because his agent already played one media outlet into writing a story that got Malzahn an extension. When’s the last coach to be in charge of three different programs in three different years? I can’t even think of one. Malzahn’s not leaving Auburn. Fuhrman’s odds: 15-1. He always said Texas would be a dream job. Auburn just threw the kitchen sink at him, and he’d be foolish to leave the job security this dream season has likely created. But never say never, and quite frankly it’s always best to land the prom queen when your stock is sky high. What if no major coaches are willing to leave for this job? Can you imagine Petrino with Texas talent? Just keep him away from the volleyball team and you’ll win huge. Jon Gruden, analyst: 15-1. Pretty sure he’s going to make every list of coaching candidates at the NFL, NCAA or high school level. I don’t think he ever sets foot on a college campus, even Texas, but as an odds-maker you’d be happy to capture dead money at this price. Major Applewhite, Texas (OC): 20-1. I don’t think he’s ready for a job of this magnitude, however why rule him out entirely? There’s nothing better than bringing a Texas man to top billing as a step up from offensive coordinator. He’s probably not quite there career-wise but still an intriguing option. Will Muschamp, Florida: 40-1. This would be the ultimate Texas move, like launching the Longhorn Network without the proper cable partners. Bringing Muschamp in after his mediocre tenure at UF would be akin to Auburn hiring Gene Chizik after he’d done nothing in Ames. Actually that’s not true; Muschamp has a better pedigree, because he did take the Gators to a BCS bowl whereas Chizik couldn’t coach his way out of a paper bag. Relax Auburn fans, don’t kill me. You’ve seen Malzahn at work this year, so there’s no defending who the real genius was behind the national championship campaign. Muschamp to Texas would be such a Texas move.